I received many emails regarding acne scar treatments available at Aeon. I’m glad that i am lucky to be blessed with good skin and i have not tried any acne scar laser treatments before. 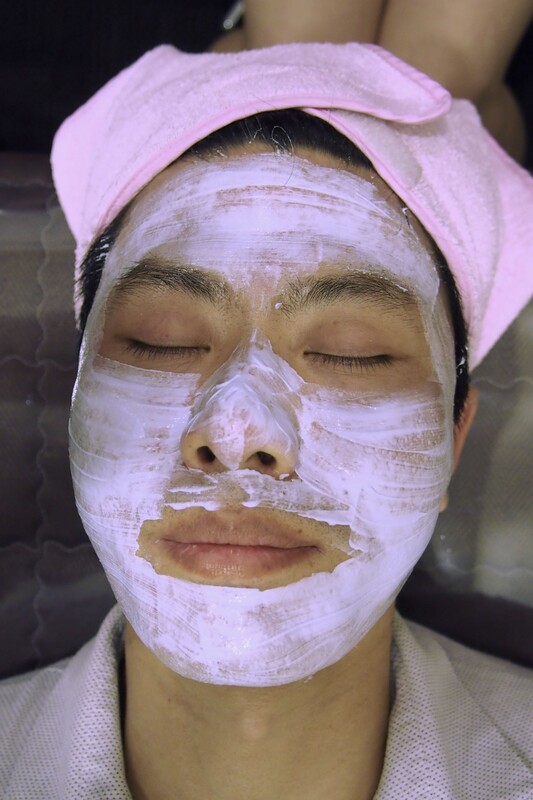 So with the permission from a patient, i managed to sit through the whole procedure so i can blog about it and for those who are curious and keen to go for acne scar treatment procedures , this post is a good read. 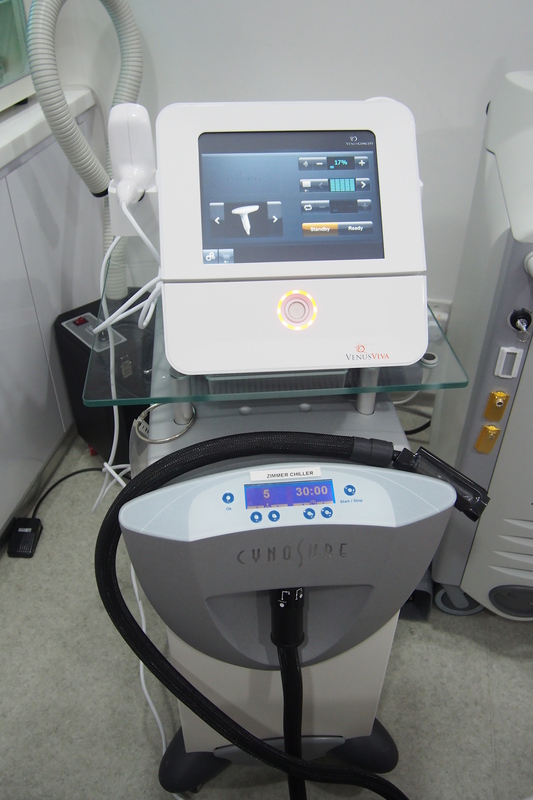 Procedure was done with the brand new Viva machine (Venus Concepts) at Aeon Medical and Aesthetics Centre. The applicator used was made up of many small and micro fine needles. These needles will be “poked” into your skin . They are so fine that you have to squint your eye just to see the needles. Before the procedure , numbing cream will be applied onto the patient’s face for 60 minutes. Esther , the aesthetician used a hot tower to clear off the numbing cream before Dr Kim proceed with the procedure. As the “head” of the applicator is very small , it can reaches the corners of the nose and chin with precision. Dr Kim will stop to ask the patient if he feels any discomfort before continuing to ensure that any discomfort are minimized. Slight pinkish markings can be seen. These are the parts where the laser needles came into contact with the skin. 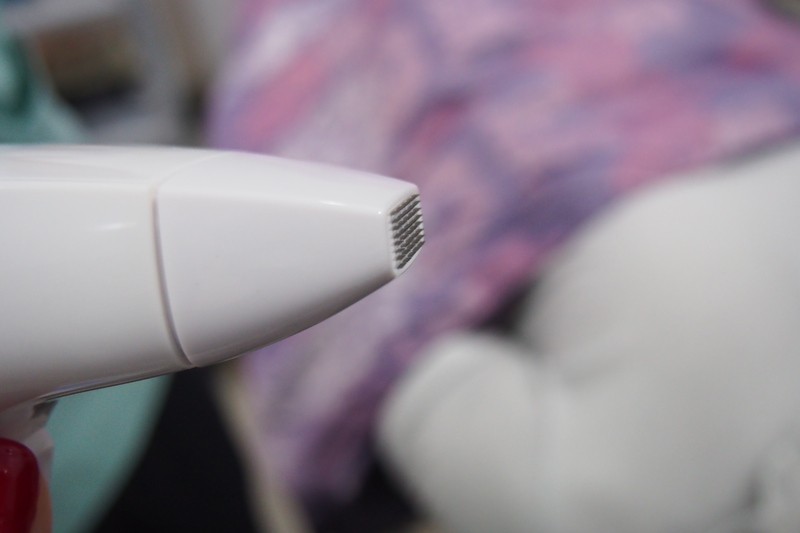 The needles helps to transmit radiofrequency (RF) energy deep into the skin to stimulate the skin cells to make new collagen which helps to reduce acne scars. There is also a patented technology which does not fire all the energy at once but at random patterns to reduce pain felt by the patient. 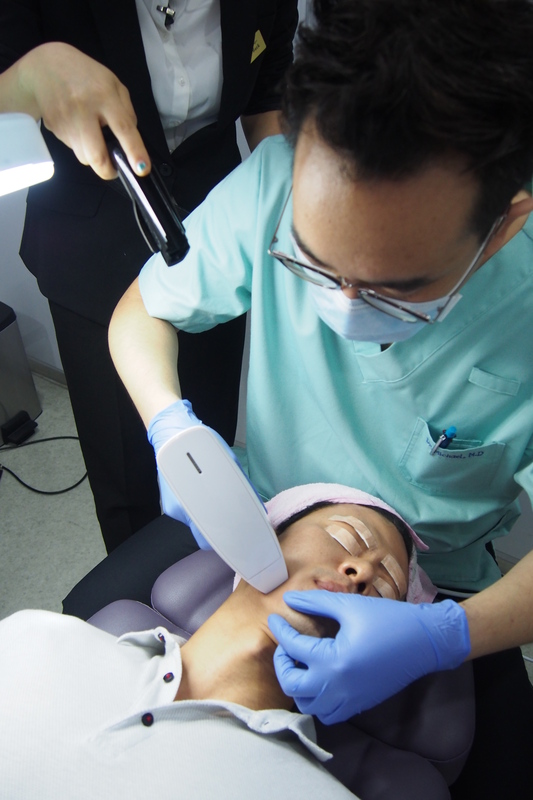 The narrow laser “head” allow the doctor to reach the corners of the noses , chin and between the upper lip and nose. Those who have had CO2 fractional laser treatment before will understand the process but Dr Kim tells me that this new nano-fractional RF method is the new standard for treating acne scars. I am told that the previous CO2 laser method has longer downtime (1-2 weeks compared to 1-2 days for VIVA) and higher risk of complications when done on darker skin types like Asians. This picture was taken right after the laser treatment. The patient was brought to one of the medical rooms for post laser care. 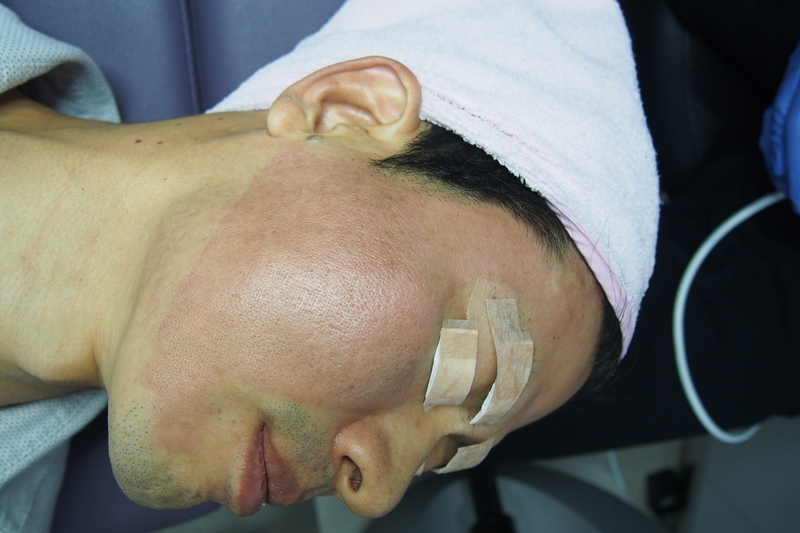 Where an ampoule and mask will be applied onto the patient’s face . This helps to calm the skin down and also to reduce the redness. 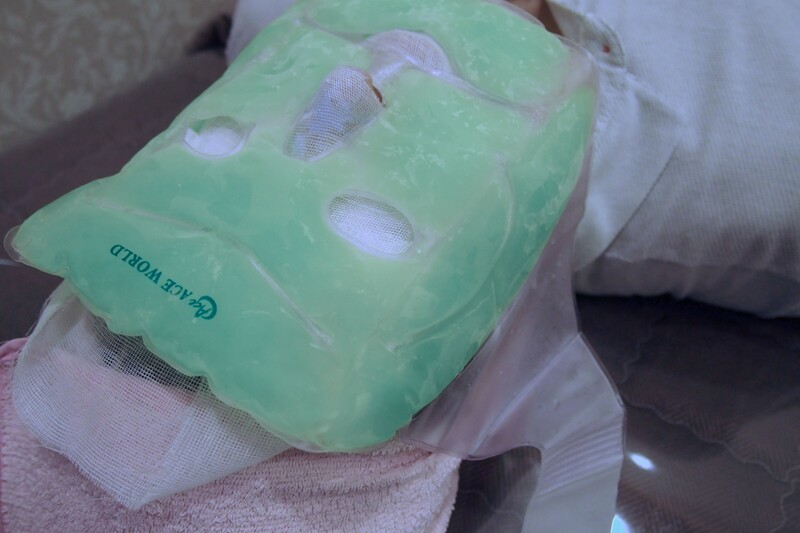 An ice pack mask was placed on top of the sheet mask to cool the skin down after the treatment so that the patient is ready to continue his daily activities after the laser treatment. The downtime is about 1-2 days of redness but you can apply makeup or BB/CC cream on top if you want. Some patients go to work the next day, while others choose to do it on a Friday so they can recover over the weekend. Patients claim the pain is very minimal with only a bit of heaty feeling. It can be done every 4 weeks and usually requires on average 5 sessions for improvement. One session will not cure all the scars and not all acne scars are the same, so it is important to have a thorough consultation with Dr Kim to assess your condition and how to treat it. 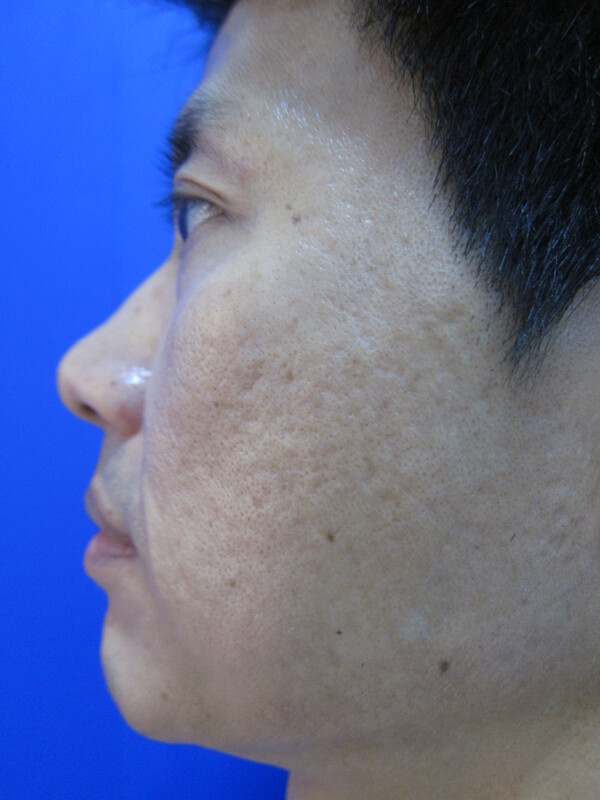 Picture below was taken a week after the laser treatment. There seems to be an improvement in the skin texture. I hope this post helps those who have acne scar problems. You can mention my name when you head down to the clinic. Staffs at Aeon are all Koreans but they speak English and Korean so don’t be alarmed if you were greeted in Korean. You can look for Clara (Clinic coordinator) or Jina (Clinic Manager).